The Cats Meow Pool combines the most exquisite craftsmanship, materals and state-of-the-art equipment available. 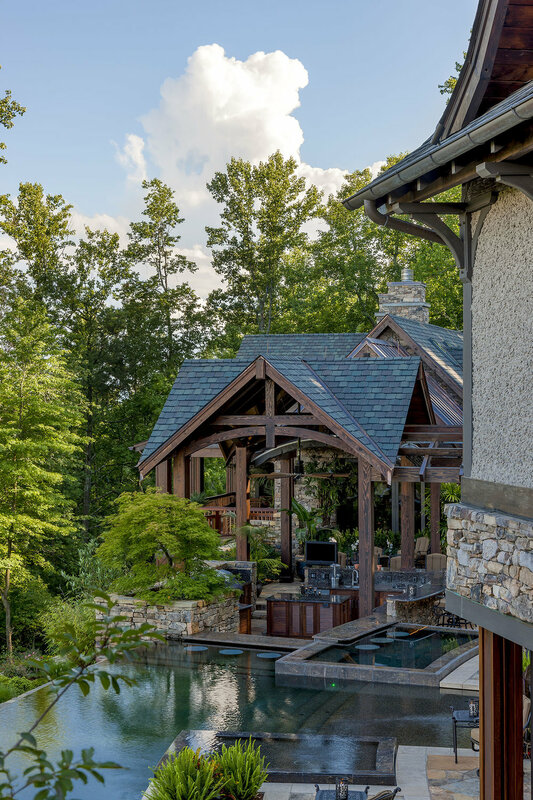 Many elements have come together to build what is one of the most advanced and over-the-top outdoor areas available in any setting, but made even more spectacular with its mountain incline and stunning views. This project isn't simply "just a pool" but an outdoor living and entertainment area with integrated, manmade waterfalls - totalling over 300 linear feet down the mountain - an in-pool, perimeter edge spa, perimeter edge childrens play area, wetdeck... all capped off with a 77-foot curved infinity edge. It all comes to life at night with integrated lighting systems and - if you didn't need any more wow factor - an in-pool fiber optic lighting system. Add in an outdoor kitchen most indoor chefs could only hope for, a tennis court in the center of it all and an outdoor hibachi grill overlooking the entire vista... this home becomes "the cats meow" of most people's dreams of outdoor mountain living.